We’re all a bit in love with this photo, via @historyinpics. It’s very hard to look at without humming the Jurassic Park theme tune in your head. 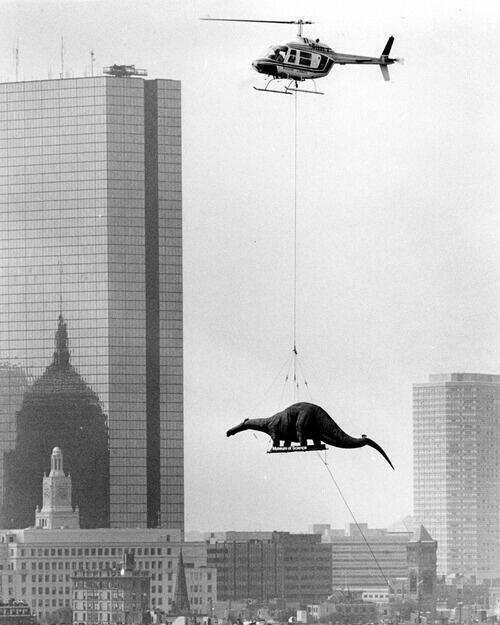 If anyone out there has more pictures of bizarre things being delivered to museums, or dinosaurs flying over cityscapes, we’d love to be alerted to them. Tags: boston, dinosaur, museum. Bookmark the permalink. Fantastic! Hope the dinosaur enjoyed the view. WOW, i have never seen a photograph like this before. Do you know if the Dinosaur is still at the museum?